Smelly men. Let’s face it, they’re a real problem. Stinky brothers, shower-dodging boyfriends and husbands who think that turning their undercrackers inside-out consitutes a legitimate change of clothes. Thankfully LUSH are on the case and have introduced a whole range of pampering goodies for the fellas in our lives. The inspiration behind the range comes from the original men’s Dirty scent that was released in 2009 by B Never Too Busy To Be Beautiful (LUSH’s defunct sister brand). 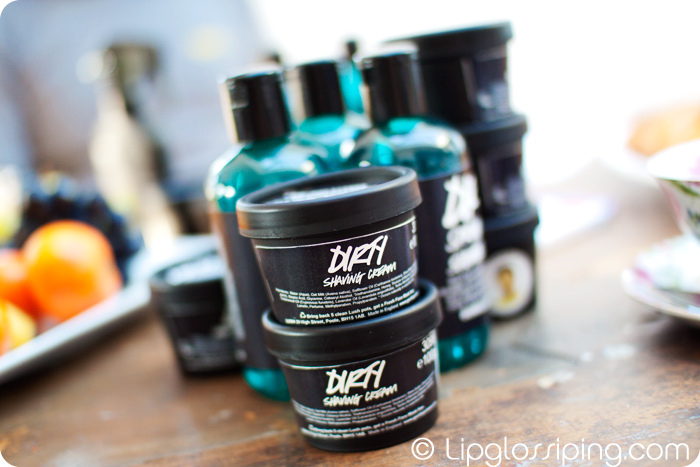 The scent proved to be such a hit that LUSH wanted to find a way to re-incorporate it into their current range of products. That all sounds straightforward enough, launch a range of men’s products that smell like an old favourite cologne and watch the pennies roll in! Though it gets a bit more interesting than that because Mark & Simon Constantine, otherwise known as The Gorilla Perfumers decided to introduce men to the concept of layering. Us women know what layering is all about right? Usually… we get our Xmas gift sets of our favourite fragrances and on special occasions we’ll use the shower gel followed by the matching body lotion before spritzing on the EDP before we walk out the door. Simple! A lovely layered scent that has been built up to full intensity and is guaranteed to last longer than our dates. 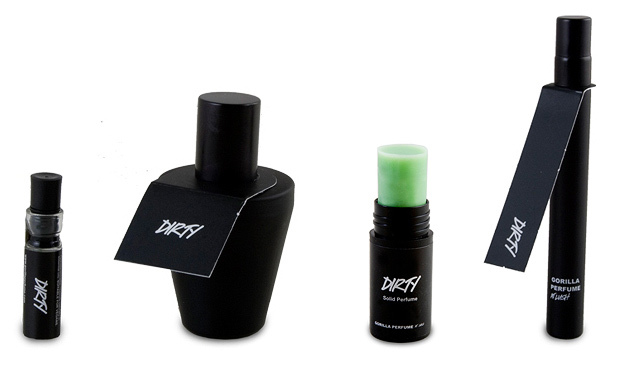 With the new Dirty range from LUSH, each product contains single notes from the original Dirty cologne. Thus, instead of layering the same complete scent over and over, you’re actually building the fragrance from the ground up! How freaking cool is that concept?!?! Spring Wash Shower Gel (£4.25 100g / £8.50 250g / £14.95 500g) is a skin-softening and skin-tingling shower gel for the body and hair. Sodium Bicarbonate works to soften the water and deodorise the skin, whilst the spearmint, menthol and fine sea salt will leave you feeling refreshed and revitalised… like you’ve showered in a mountain spring! This smells like Spring and Summer rolled into the perfect package… it’s zingy, fresh and invigorating. Mr. L likes it because he can wash his hair without having to reach for another bottle *tsk*. Shaving Cream (£4.95 for 100g) Shaving with a cream offers a closer, smoother shave and this one has a base of ultra-softening oats, which are steamed to extract their softening, calming and moisturising mucilage. This is especially good for dry skin that’s easily aggravated by shaving, as the razor glides over the cream leaving the skin soft and nourished. There’s also plenty of moisturising shea butter, lavender and honey to soothe any irritations/redness and calm sore skin. It’ll cover a multitude of chins. I was a bit unsure that there was such a thing in this world as man-lavender but I’ve been duly informed that this is neither girly nor granny. Toothy Tabs (£2.00) a brand new, patented idea from LUSH to save hundreds of toothpaste tubes heading to landfill – these solid tabs minimise the need for packaging and preservatives and come in a handy 100% recycled box. Crush in your mouth and brush as normal with your toothbrush and enjoy the fresh, minty hit with a hint of oranges. 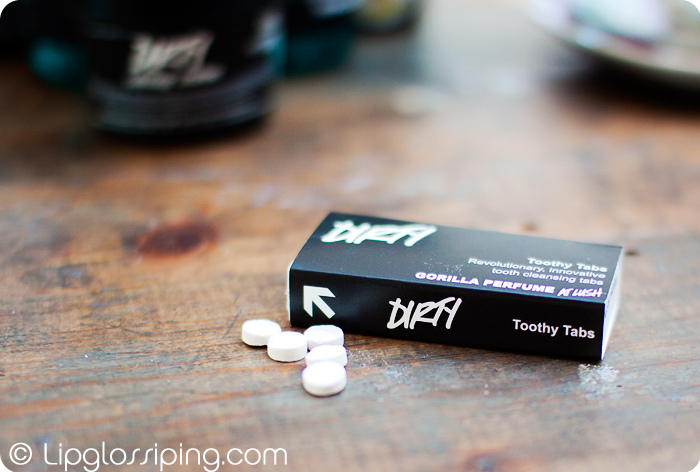 A Dirty Toothy Tab will guarantee oral pleasure! The sodium bicarbonate will clean teeth while the cream of tartar works to whiten them and spearmint freshens breath. Your mouth will be left feeling fresh and clean all day long. At the launch, I found myself sitting opposite Simon Constantine and next to the inimitable Helen Ambrosen (genius LUSH product inventor) trying my hardest not to have a fangirl moment. I kept myself composed and being the hard-hitting, serious writer that I am… took one for the team. No wait, this is impressive. I surveyed the new Toothy Tabs with interest before piping up with the most important of questions that had clearly been left hanging in the air unspoken. “But, won’t they like, yano… get like… wet, errr melt? Yano, what with being in the bathroom n’all?” Genius. Apparently the box is coated so unless you plunge them in the sink or leave them in a puddle for hours on end, a few splashes won’t effect them. Right. Glad I cleared that one up for everyone involved. I think I’m a little too conditioned in my 29 years of using paste to get on board with these… they’re a great idea and seem to work well enough but I find myself missing my Colgate after a couple of days. Verdict: Don’t take them on a night out as breath fresheners, you’ll only get your shoes searched by the ugly doorman. Hair Styling Cream (£5.95 100g) achieve the perfect just-got-out-of-bed head with this new, firm holding styling product. The Japan wax enables a really strong hold with a natural appearance, while fair trade coconut oil, linseed gel and balm herb infusion condition. There’s also cocoa butter to soften and illipe butter to add shine. Lightly scented with sandalwood and pine oil, your hair will look and smell great. This is a matte-textured styling cream that does indeed give pretty impressive hold. It smells sublime and really, as the person not using it… that’s all I need to know. Verdict: Don’t mistake it for the shaving cream. Body Spray (£12.50 200ml) an alternative to deodorant (and aerosol cans), the Dirty Body Spray is for spritzing under the arms for a freshen up instead of using the odd squirt of cologne. The skin under the arm is very delicate and needs an inert product, so this is ideal. Sandalwood oil, lavender absolute, neroli oil, spearmint and thyme all blend to form the unmistakable Dirty scent, this is for the man who likes to just spray and go! Horribly un-PC but amusing nonetheless is the reference to “Italian Showers“. Thankfully this scent avoids the so-called Lynx Effect with a far more sophisticated mix of oils that combine to provide a truly clean smell. It has quite good depth for a body spray, not too thin or brain-searingly alcohol heavy. Verdict: Squee! The next best thing to squirting your man with a bottle of Dettol is squirting your man with a bottle that LOOKS like a bottle of Dettol! Dirty Fragrance (£2 2ml sample / £30 30ml bottle / £4.50 solid / £9 10ml spritzer) Complete your collection with the original Dirty perfume. Dirty was a classic in B Never Too Busy To Be Beautiful for its crisp and fresh spearmint notes, clean burst of salt air and herbal fragrance. It’s a complex perfume without being too heavy; you’re going to love it. I have a love/hate relattioship with LUSH fragrances. I nearly always hate them for the first 5 minutes of wear, I find them overpowering like the scent equivalent of being repeatedly struck about the head with mallet. And then… when it’s time to leave the house… the fragrance dries down, it mellows and blends with my skin chemistry. It’s only at this point that I understand the fragrance and gain respect for it. I still might hate it but it’s finally stopped screaming and given me the opportunity to make it’s acquaintance. Most of the time though? If I can make it through the opening notes… I love the heart and base of the scents and find they wear for an incredible length of time on my skin. Verdict: Go for the sample first and give it time to adjust. 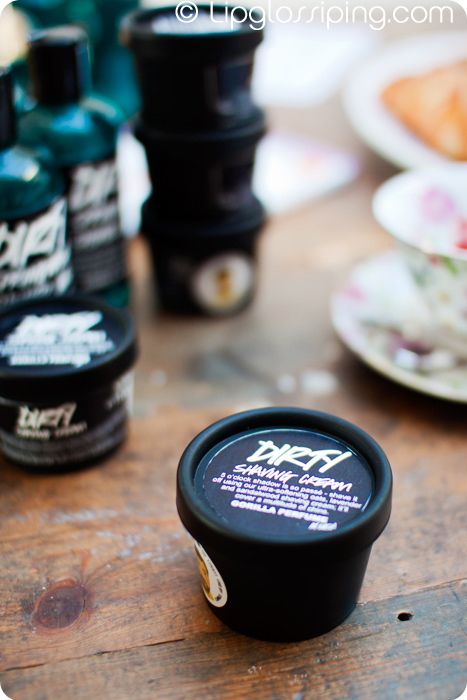 Dirty is a comprehensive new release from LUSH that goes a step further to involve fragrances in a more meaningful way than simply scenting the products with them. Nothing in the line-up invokes that stereotypical men’s sporty scent that can be detected in locker-rooms up and down the land. Thank God. Uunderneath that macho, “dirty” exterior? It’s beautifully clean. * the products featured in this post were provided for review consideration F.O.C. I utterlu adore the Dirty range – it was always my favourite B Never scent. It’s just so beautifully different to the rest of the heady floral/hippish/sickly sweet Lush scents. Yum Yum! So happy that Dirty is back! Going to grab the shower gel ASAP. Those Toothy Tabs things look interesting. How many do you get in a package? I am obsessed withthis range. I’ve been wearing it every day since I got it. The styling cream is brill for crumpy beach hair, the shaving cream gives me the softest legs ever and I am wearing the body spray and perfume daily. I love it. I think the toothy tabs are a fantastic lush innovation but they aren’t for me! Damn, I just bought the b/f a Natio gift set for our weekend away. I like the idea behind this set, this is a possible Easter present (along with some good ol Haighs chocolate) . Is there a girls version of this? Think i’ll get some of this my boyfriend, after all, he’s a smelly boy. Although I fear I may end up nicking some of this stuff….teeheehee. I thought the Dirty range was unisex? Anyway, I’m a girl and I wear the cologne/body spray and I love it, always get asked by people what Im wearing, I spray it all over and it lasts very well. Got a bottle in London last year at one of Lush’s preview events and was running out, so glad they finally released it. I giggled at the bottle of Dettol! I’ll never be able to look at it the same now! This range sounds interesting, especially those toothy tabs. I am keen to have sniff of the products in store. I love the name DIRTY – no beating around the bush there! The shower gel sounds so yummy! I might be tempted to just purchase it for myself…and ditto for the shaving cream, and the toothy tabs…and perhaps some more stuff after I check it out at LUSH. My nose is seriously craving a LUSH hit now, after my mind tried to conjure up what the range will smell like. I need to hit my stash of LUSH goodies asap! Eeek… I went in to try this today and it smells great… I think I’ll be going back in tomorrow to pick up the body spray but while I was in I accidentally sprayed my mobile phone with it and the smell really lingers! That’ll teach me to spray my wrist while holding my phone! And i like the sound of the body spray and the groovy bottle. SQUISH SQUISH!